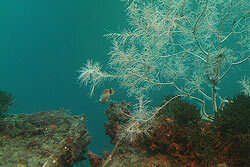 Anthozoans are polyp-like Cnidarians which are only found in marine habitats. 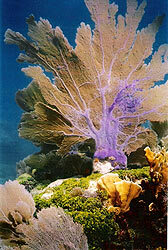 They include the well known sea anemones, soft corals and hard corals (anemone-like groups with skeletons) and animals without skeletons (such as tube anemones), as well as the less well known sea pens, sea fans, blue coral and black coral. There are over 6,000 species of Anthozoans which are found from the intertidal zone to the depths of the trenches (to 6,000 m). 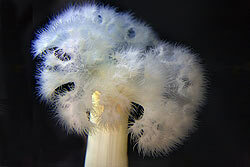 Unlike other cnidarians, anthozoans do not have a medusa stage in their development, they live exclusively as polyps throughout their life cycles. 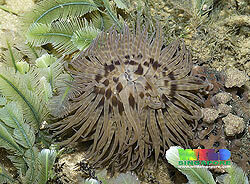 Instead, they release sperm and eggs that form a planula, which attaches to some substrate on which the cnidarian grows. 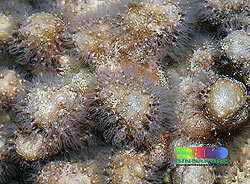 Some anthozoans can also reproduce asexually through budding. An anthozoan individual has a saclike, cylindrical body divided by ray-like partitions known as septa and a ring of tentacles surrounding the mouth. 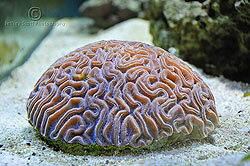 The septa can easily be seen in corals. 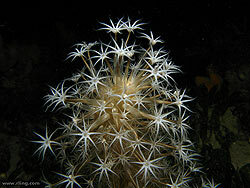 Anemones and certain species of coral are solitary living animals, however most corals form colonies of genetically identical polyps; these polyps closely resemble anemonies in structure although they are much smaller. While anthozoans have nematocysts and many feed on large prey or particulate food, many anthozoans gain their energy from symbiotic algae growing n their tissues. 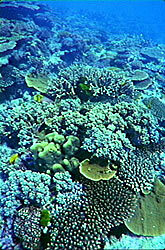 Reef-building corals survive extremely well in tropical waters as most have symbiotic dinoflagellate algae living inside their tissues. 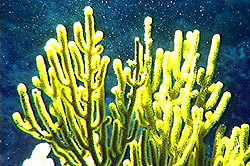 Coral polyps also use their tentacles and nematocysts to feed, but Symbiodinium algae may actually produce most of a coral's food. 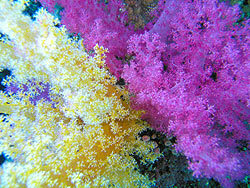 For this reason, reef-building corals are always found in shallow-waters with plenty of light available. themselves "inside out" and display their tentacles. Surprising ability to swim from an animal that is usually fixed to its spot.